Villa Nova is for rent near Ibiza Town in southern Ibiza, only 2 km. from the center and 3 km. from the well-known beaches Playa d’en Bossa and Talamanca. Spacious holiday villa for 10 with private pool, air conditioning, WiFi internet and sea view! Luxury vacation villa Cuba is for rent in near Jesus with shops and restaurants, only 3 km. from the sandy beach of Talamanca. Wonderful, recently built vacation villa with 4 bedrooms, 3 bathrooms, private pool, air conditioning and WiFi internet! Vacation villa Mirage is for rent near San Jordi de ses Salines in southwest Ibiza, close to the beaches of Playa den Bossa and Las Salinas. Wonderful vacation villa for 12 with private pool, air conditioning, WiFi internet, sea view and private tennis court! 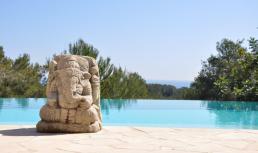 Vacation villa Tamara is for rent on a hill near Cap Martinet, one of the most sought-after areas on Ibiza (Spain). Lovely vacation villa for 8 near Talamanca beach with swimming pool, air conditioning, WiFi and splendid sea view. 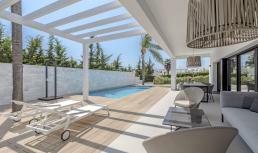 Perfect villa for a holiday with family or friends!